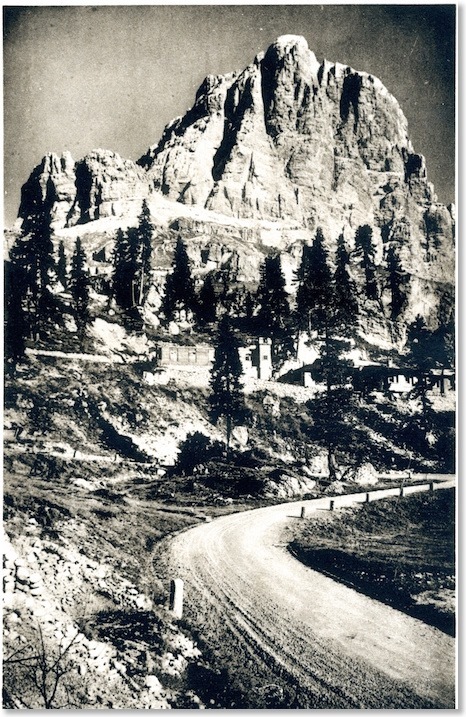 In the Bolzano to Cortina booklet, Zardini’s itinerary is now heading us east, and rapidly downhill towards Cortina. This view is found now at a tight series of bends by the car-park for the Cinque Torri chairlift station, at the Rifuigio Bai de Dones. It is a view in a north easterly direction from that spot. 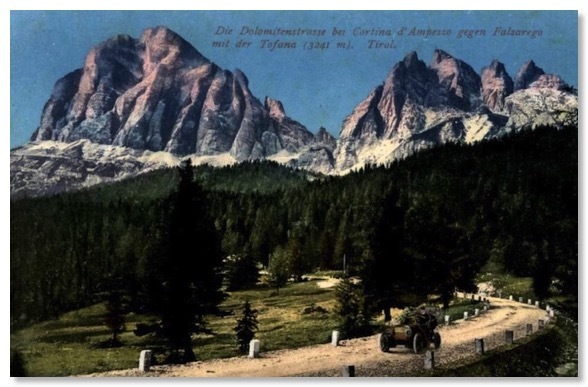 The same photo appears in both Zardini booklets, and is actually seen far better travelling away from Cortina than towards it.. Some realignment of the Great Dolomite Road has happened here, altering the precise curve of the bends, but the view is otherwise unmistakable. 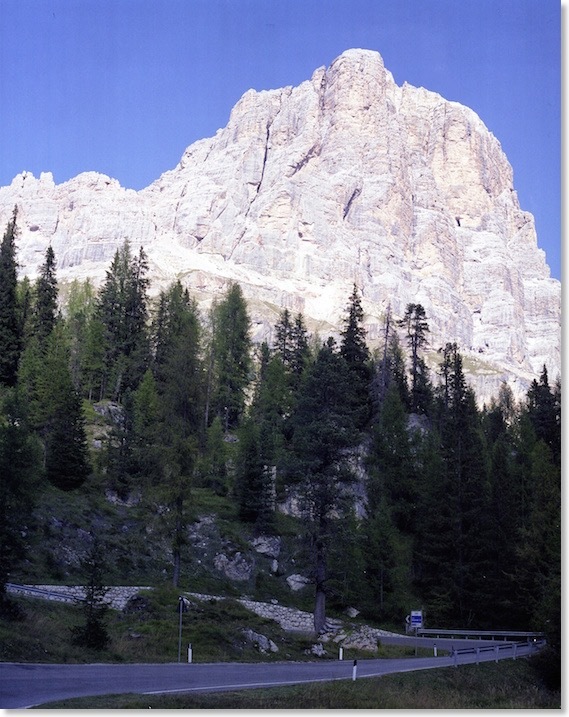 Trees near the current line of The Road made for difficulties fitting the modern view in as narrow a frame as Zardini managed. 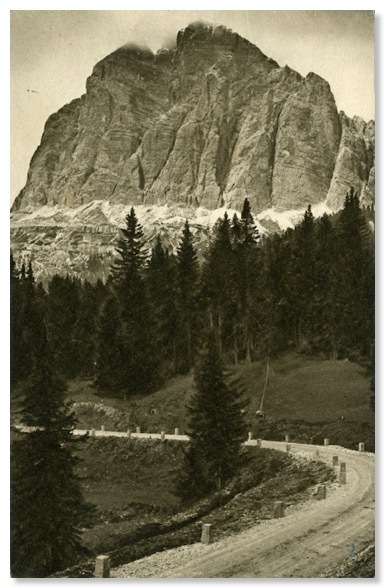 The Tofana de Rozes and the minor peak to its left, the Castelletto, were witness to some intense and prolonged mountain warfare, including tunnelling and explosions which removed much of the original top of the Castelletto, which is the subsidiary peak left of shot. The Zardini photograph will have been taken not long after the end of the First World War. Across the centre of the photo can be seen some elaborately detailed military buildings. Today, while it is still possible to follow the line of the terrace on which the buildings stood, all that remains of them is a remnant of the tower in the centre of Zardini’s shot. Much of the slope just above The Road here has been “stabilised” in recent years with wire netting and cables. 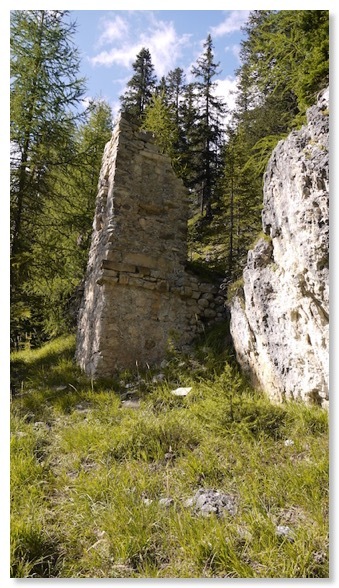 It is probable that other parts of these ruins were removed at that time. Tree growth on this slope has also been prolific. 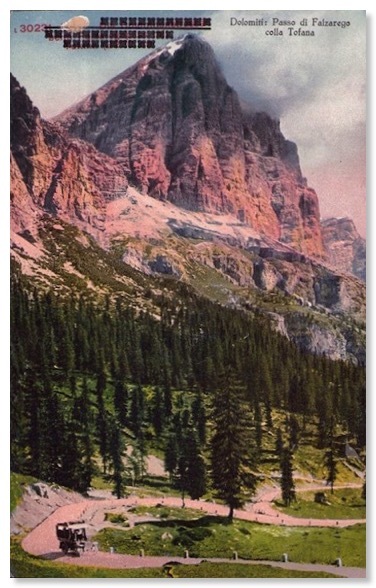 This card shows the same (presumably post WW1) overprinting seen under Photo 10. 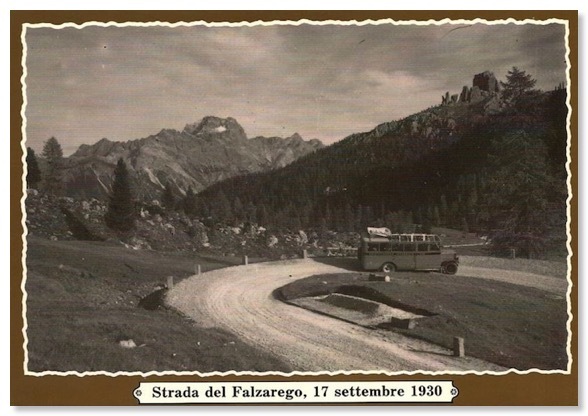 The view is generally similar to Zardini’s but from farther up the Falzarego Pass.